Starring: Sam Claflin, Emilia Clarke, and more. June 3, 2016 brought upon a romantic drama film that has been highly anticipated by many since its announcement to make the famous jump from book to film. From being much anticipated by its book fan base to gaining a large following upon its trailer release, ‘Me Before You’ heads into theaters with a full head of steam. Seemingly destined to do well and entertain its audiences through laughter, romance, and tears. ‘Me Before You’ first introduces us to Will Traynor (Sam Claflin) as he is a lively young man running off to work one day. As he goes out for his trek to work during a stormy day in the UK, his day is suddenly turned upside down as he is struck by a passing motorcycle. 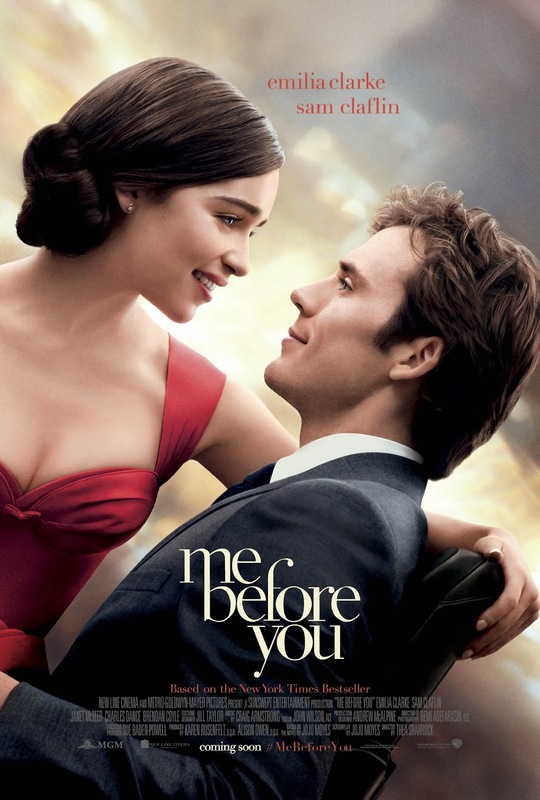 Not only is his day ruined, but his life is as well… Fast-forward the time two years, we are then introduced to a young woman working in a cafe by the name of Lou Clark (Emilia Clarke). After a brief introduction in the form of her interacting with her cafe patrons, she suddenly is pulled to the side by her boss who informs her she is going to be let go from the cafe due to it closing down. Jobless and looked upon to provide for her tight-knit family, Lou goes job hunting for a new way of income and comes across a position as a care-taker of sort for the wealthy Traynor family. After a few awkward interactions and unfortunate incidents during her interview with Camilla Traynor (Janet McTeer), Lou is given the position and introduced to the man she will be taking care of; the Traynor’s son, Will Traynor, now confined to a wheelchair after his incident. From then on, Lou and Will begin to spend time with each other. Learning of each others personalities due to the forced circumstances but over time begin to warm up to each other and become closer than ever expected. I enjoyed ‘Me Before You’ much more than I had anticipated. I was originally interested upon its trailer release (and I mean, it is easy to sell me when you attach an Ed Sheeran song to the trailer, but that is besides the point. ), but now that I have actually seen the film, I am more satisfied in the result of my viewing than expected and also very interested in reading the book series. To start, Sam and Emilia were excellent. I see a very strong transition from TV to film through Emilia Clarke. Especially going from playing a role like Daenerys from ‘Game of Thrones’ and even the strong personality role of Sarah Connor in ‘Terminator Genisys’ to the sort of ditsy, sarcastic, soft, and kind role of Lou Clark. Her character had me honestly laughing in multiple scenes as she had hilariously awkward interactions with some other characters on top of her constant sarcasm. Sam Claflin was nothing short of hilarious as well. His equally sarcastic character of Will Traynor was frequently sparking laughs among the crowd as well as his relentless strong personality that transitioned from his able-bodied self to his handicapped self. On a different note, the chemistry between the two worked very well. Nothing ever felt forced, in my opinion. Everything was smooth and easy-going. It was very entertaining to follow and the story as whole was something elegant yet heart-rending all the same. For a romantic-drama, I enjoyed this film very much so. I recommend this for all audiences as it is much more than the typical romantic feel-good movie.